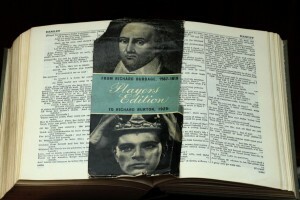 Pearson’s book was published in 1950. He estimated the cut-off point for the actor-manager came at the end of the 1914-18 war. Among those he wrote about were Sir Herbert Tree, Sir Frank Benson, Lewis Waller, and Oscar Asche, all born between 1850 and 1890 and all strong-willed characters. Pearson’s opinion was that although actor-managers had not been perfect, “the daring of an individual is preferable to the discretion of a committee”. How well I remember that first Hamlet at Stratford, the opening of the great parti-coloured curtain and the step forward to find out whether the great struggle in Hamlet’s sould had really been imparted to the audience. He became famous for his curtain-calls at which he always appeared exhausted, holding on the curtain for dramatic effect. 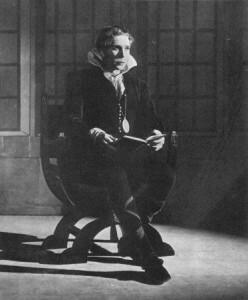 In 1937 he repeated his Hamlet and added Iachimo in Cymbeline and the Chorus in Henry V.
All called for the vocal skill and powerful personality which Wolfit had in abundance. During his years in Stratford he met and fell in love with the actress Rosalind Iden, and heartened by his success he created a theatre company of his own using actors who he had worked with in Stratford. From 1937 onwards touring became a way of life for him. He performed right through the war, aiming “to be the switch that could set the electric current of Shakespeare’s poetry and imagery throbbing through a crowded auditorium”. Between 1937 and 1945 he estimated he had undertaken 2240 performances of 15 different plays in countries including Canada, the USA, Egypt, France and Belgium and continued to tour after the war. Wolfit believed in the theatre as a cultural and educational force. His contribution was immense, for he provided people all over the British Isles, especially during the war, with the opportunity of visiting a playhouse, perhaps for the first time, and seeing Shakespeare with the leading roles played by an actor of extraordinary gifts. 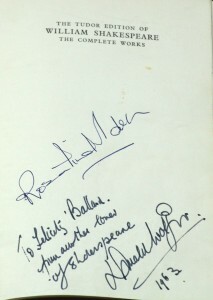 My father was the lighting director at the National Theatre, Nairobi and in 1963 Sir Donald Wolfit and his wife, Rosalind Iden, were invited to Nairobi to give some of their pieces from Shakespeare. They gave some wonderful, nowadays I would think “over-the-top”, performances. I particularly remember the death scene from ‘Othello’ and the mad Lear. I was about 14 at the time and had never seen anything quite so captivating and I used to stand in the wings watching in awe. 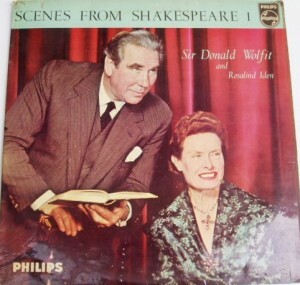 One night as Donald Wolfit came off stage he patted me on the head and said “do you like Shakespeare, little girl”. I simply nodded, too taken aback, by this great actor actually speaking to me, to say anything! 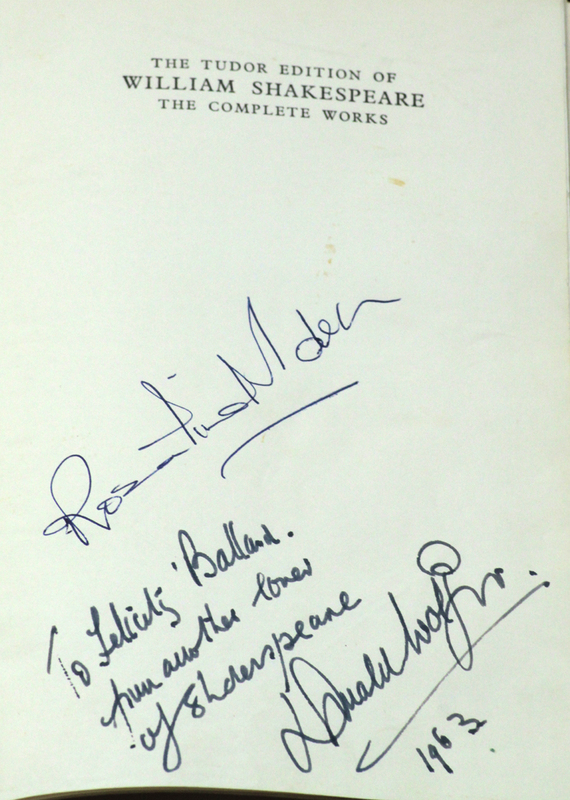 When they came to leave Nairobi they presented me with a signed copy of the Complete Works which has become my most treasured possession. He developed a majestic persona, grandiose, passionate, often pompous. He could be frightening and brutal but also astonishingly kind and genuinely humble. It may have belonged to a previous era, but his barnstorming style made a big impact, not least on Felicity in whom Wolfit inspired a life-long love of Shakespeare. She has lived for many years in Stratford-upon-Avon where she continues to follow the RSC’s work, and I would like to thank her for sharing her story and photographs of her treasured copy of the Complete Works with me. This entry was posted in Legacy, Shakespeare on Stage, Stratford-upon-Avon and tagged actor-manager, Donald Wolfit, Felicity Howlett, Kenya, Nairobi, Rosalind Iden, theatre, touring. Bookmark the permalink. Great post, Sylvia. I find it extraordinary that Sir Donald worked for television through to the late 1960s, and that there is a truly remarkable recording of him starring in a studio production of Ben Jonson’s Volpone in 1959. Sadly, The Life and Death of King John (1952), in which he played King John, was just before the BBC started recording television plays and, despite the late date, there seems to be no extant copy of Ghosts (1968) in which he took the role of Pastor Manders. In a slightly less exalted context, he also played the regular character of Sir Andrew Wilson in the ATV series Ghost Squad (1961-63).